I have heard this question (or similar versions of it) quite a few times since I became resident to BaderasBay several years ago. And I don’t blame the perplexed observers. 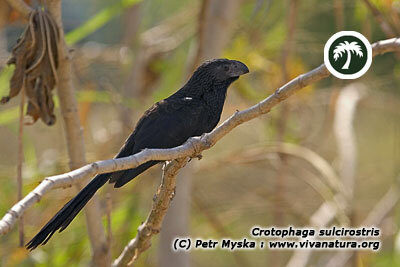 The Groove-billed Ani, with its jet black body and a prominent heavy bill “decorated” with a series of deep groves, is indeed quite an unusually-looking bird. There is not much to be said about its body color, which is simply anthracite black overall and especially shiny on the chest and back. Its body reaches lengths of 30 – 34 cm, of which one half is the tail. The most striking feature of the bird is its heavy, curved, laterally-flattened bill, which on the first sight might resemble that of a parrot. Anis, however are cuckoos! Such as many other species of cuckoos, Anis often live communally. In fact, I have very rarely seen a single individual; the most frequent sight is that of a group of Anis slowly moving from one bush to another in a loose foraging group, looking for insects, lizards, seeds and fruits. Their communality, however, goes much farther than that. Anis belong to birds, who nest communally – several females lay their eggs into one common nest and all members of the group take turns incubating them. This form of reproductive behavior is called plural female joint-nesting and quite interestingly is present in all species of the subfamily Crotophaginae (Hughes, 2003). Why such behavior exists has been studied extensively. The evidence suggests that the advantage of communal nesting is the reduction of parental care costs, particularly the risk of mortality during incubation (Vehrencamp, 2000). Groove-billed Anis are resident to the Bay area and can be found in a variety of habitats, especially second growth forests, road sides, plantations and greener suburbs (Howell, 1995).